Magnolias (Magnolia spp.) are all beautiful trees, but they are not all alike. You can find deciduous magnolias that drop their shiny leaves in autumn, and evergreen species that provide year-round shade. Magnolias can be shrubby, medium tall, or towering. The some 150 species in this tree family are known for – and often grown for – their fragrant, frothy flowers. Plants grown from seed can take a very long time to flower, while cultivars have been developed for rapid blooming. If your lament is “my magnolia tree does not bloom,” take action to help the tree. 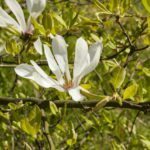 Read on for information about magnolia blooming problems and what to do to encourage those beautiful flowers. Whenever a flowering tree fails to blossom, the first thing to do is to check its hardiness zone. The plant hardiness zone indicates what type of weather your tree will survive. Checking hardiness zones is even more important with warmth-loving magnolias, an iconic tree of the American South. Each species has its own hardiness zone but most like it warm. For example, southern magnolia (Magnolia grandiflora) grows best in U.S. Department of Agriculture plant hardiness zones 7 to 9. A magnolia planted in a too-cold climate may not die, but it is not very likely to flower. The flower buds are more sensitive to cold than any other part of the tree. This may be why you are singing the “my magnolia won’t bloom” blues. If your magnolia blooming problems are not related to the climate, the next place to look is the planting situation. Magnolias can grow in shade but they bloom best and most generously in full sun. Soil quality might also have a role in the problem. It is best to use rich, acidic, well-drained soil with a pH of 5.5 to 6.5, amended with organic material. A soil test can help explain why a magnolia tree doesn’t flower. Lack of minerals or micronutrients might be your problem. If you offer the tree nitrogen-rich amendments, like alfalfa mulch, the soil may be encouraging vegetative growth at the expense of flowers. Add whatever elements the plant is missing by making holes a foot deep and 6 inches apart around the drip line of the tree. Put the nutrients in the holes and water well.